When you talk about the Avengers, there’s one quintessential Avenger who often gets overlooked. Someone who’s been with the team almost since the beginning and has stuck with the team for most of its career. I speak, of course, of Hawkeye. Hawkeye is easily one of the most popular Avengers (Outside of the big three and Hulk, who’s only actually had a short career with the team), and he’s even more popular following his introduction into the movies. And yet he still gets the short end of the stick on action figures. It seems that Hasbro is finally wising up, though, and they’ve chosen him as one of the anchors of their latest Marvel Legends line-up. 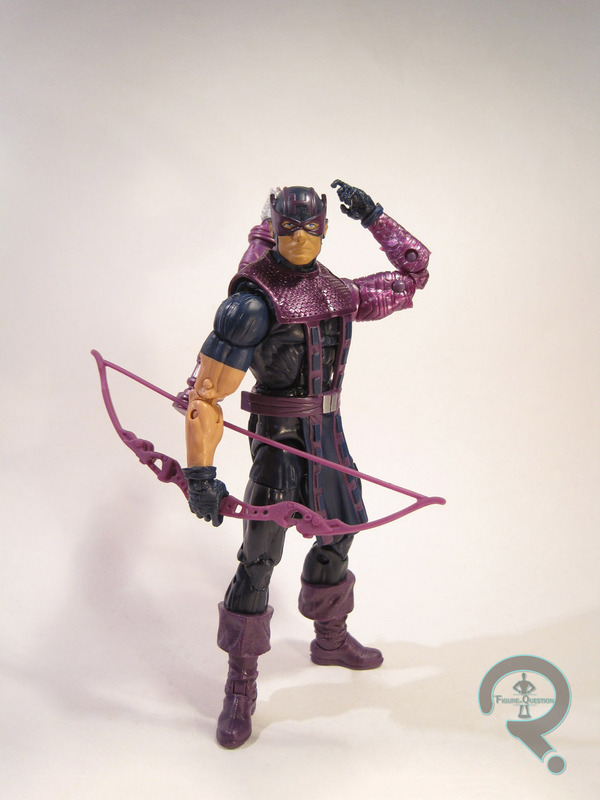 Hawkeye was released as part of Series 1 of the Avengers Marvel Legends Infinite Series. He’s the first figure I’ve reviewed from this series that actually has his own name on the box (okay, technically he’s “Marvel’s Hawkeye” but that’s splitting hairs!) 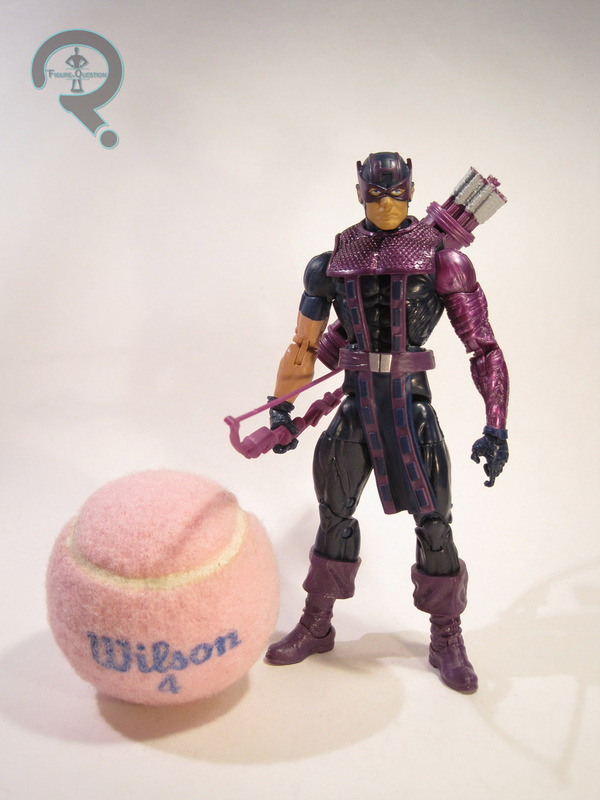 This Hawkeye figure was originally meant to be a variant version of the Modern Hawkeye figure that made it into one of the last pre-Infinite Series line-ups, but the refresher cases he was meant to be a part of never happened, leaving him unreleased. Hasbro seems to be dead-set against letting any of their prototypes go to waste, so here he is now. The figure is a little over 6 inches tall and features 32 points of articulation. He’s based on the look that Hawkeye was sporting during the “Heroic Age,” right after Clint returned to the Hawkeye mantle. It’s a good look because, while it’s technically a modern look, it’s got all the trappings of a classic Hawkeye. And that’s a good thing, because the last classic Hawkeye in this scale was way back in Series 7 of ToyBiz’s Marvel Legends line (and that one still goes for quite a pretty penny!) The figure is built on the ever-popular Bucky Cap body, with the cuffed boots like we saw on Zemo and Boomerang. The left arm has been replaced with that of the Cap Marvel Legends Infinite Series Winter Soldier, to give it more of an armored look, and that’s a change from the initial prototype. Aside from the slightly small wrist size, it’s a good change, and it does add some diversity to the figure’s sculpt. In addition to the re-used pieces, Hawkeye has an all-new head and a rubber overlay for his upper torso, straps, and loincloth. The head certainly shows some more character than the last classic Hawkeye did, but it seems a bit too… square? I don’t know. It just feels a slight bit off. It’s not terrible, though. The overlay is a pretty good piece, with some very nice sculpting. It would be nice if it were a little thinner, and the snap on the side where it connects is rather obvious, but it’s a good piece. There’s also a quiver piece that plugs into his back to complete his look. It appears to be the same piece from the modern Hawkeye this was meant to be a swap of, which means it’s technically not accurate to the costume, but that’s a minor nit. The biggest issue with it is that it just doesn’t want to stay on his back. It just keeps popping off! The paint on the figure is generally rather straightforward. I might have liked for the purpled to be a little brighter, but he looks pretty good. Everything is applied pretty cleanly, and there’s no real slop or bleed over. I also dig the metallic purple for the arm. It’s a nice touch. 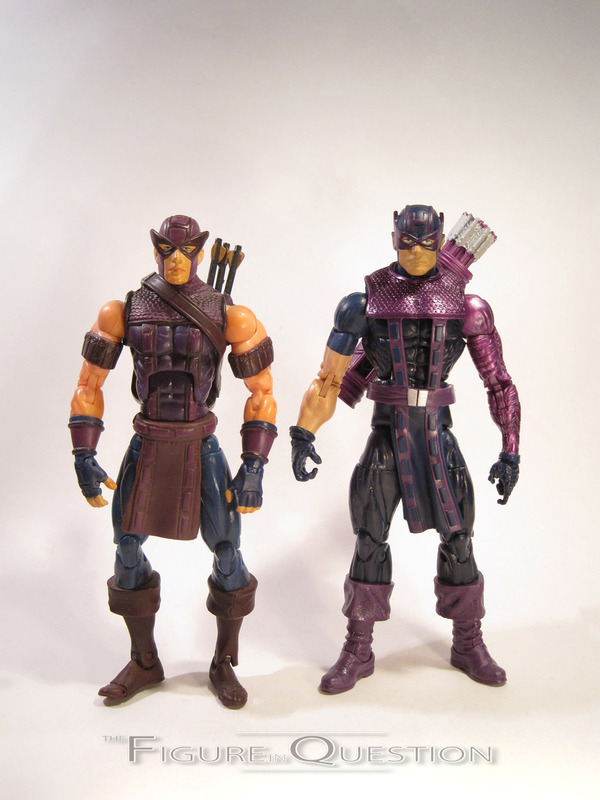 Hawkeye includes a bow (molded in purple) and the torso of Odin/Future Thor. The lack of any arrows to hold is criminal, especially since the Toybiz Hawkeye had a metric ton of them! I never got really, super excited by this Hawkeye figure. I mean, I fully intended to get it when it was originally announced, and I was a little bummed when Hasbro said it wasn’t coming out, but I was pretty content with the ToyBiz figure. In hand, I do really like this figure, and I think it may have a slight edge on the previous one (mostly due to the superior base body), but it doesn’t blow it out of the water in the way that, say, Scarlet Witch does to her original figure. This figure still has a few minor issues that hold it back from perfection. That said, it’s the best Hawkeye in this scale, so that’s certainly a plus. *Want a Hawkeye figure of your own? He’s currently in-stock with our sponsors over at All Time Toys! Click here to check him out!